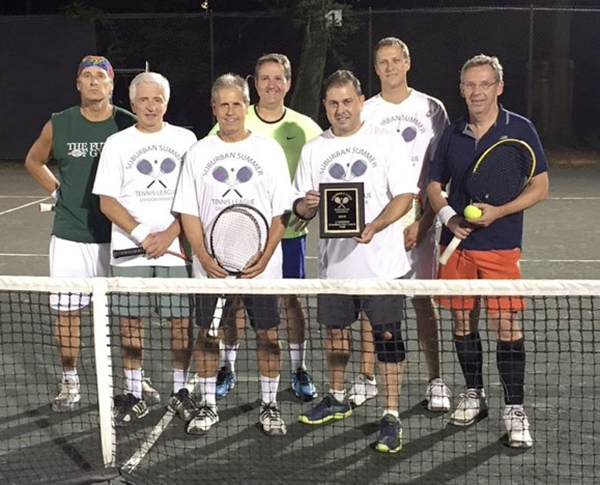 The Cranford Clay Courts Club Tennis Team won its first championship title in the 2018 Suburban Summer League A Division with an impressive season record of 25.5 wins and 9.5 losses. The League Championship came down to the final matches of the season as Cranford defeated Bradford Beach & Tennis Club by a score 4-1. The Doubles Team of Mike Abrams and Gary Snitkin clinched the League Championship with a decisive 6-1, 6-2 straight set victory. The Suburban League, an Adult Tennis league which includes most of North Jersey’s leading Tennis Clubs, is divided into two divisions. The league’s A Division included top ranked teams from Summit Tennis Club, Copper Springs Beach & Tennis Club, The Maplewood Club, Morristown Field Club, Bradford Bath & Tennis Club, Center Court Athletic Club and Arlington Players Club. Teams typically played five doubles matches each week during the season, and the overall winner is determined by the total number of sets won over the course of the season. Cranford’s undefeated first doubles team of Mike Smolensky and Mike Boutillette led the Club’s team and league with a perfect 7-0 record. Team members included Paul Rama, Karl Rosen, Mike Conte, Mike Abrams, Captain Gary Snitkin, Ed Quinn, Tim Brown, Sergey Shapoval, Chris O’Neill and Alex D’Amico. The three courts of the Cranford Clay Courts Club, located on Springfield Avenue in Cranford, were originally a part of the historic Cranford Canoe Club, one of several Canoe Clubs popular on the Rahway River in Cranford from the 1870’s to the 1920’s. After decades of Cranford Township municipal operation of the courts in the 20th Century, a group of local tennis players formed the Cranford Clay Courts Club in 1992 and took over full operation and management of the courts. The Club is entering its 27th Season with a new Championship Title added to its long history in the tennis world. International players who have made appearances on the Club courts include Bill Tilden, Indian star Vijay Armitraj, and United States Wimbledon semi-finalist Tim Mayotte. Paul Rama, Karl Rosen and Sergey Shapoval.